Nowadays, YouTube provides more and more videos in HD quality: 720p, 1080p and 4K resolution. As an video fan, you really benefit a lot. When you travel or go out, you may need watch your favorite videos to kill time. HD videos should give you better visual experience, but the question is that not all places can provide Wifi or network in high speed. You need download these HD YouTube Videos first with the help of HD YouTube Video Downloader before travelling or going out so that you can enjoy them on your computer, iPhone, iPad, or HD TV offline. As a powerful HD YouTube Video Downloader, Any Video Converter Ultimate enables you to download HD YouTube videos more smoothly and faster, which can support downloading online videos from100+ sites including YouTube, Facebook, Dailymotion, Vimeo, etc, and you are also allowed to convert videos downloaded from YouTube to other video format. Just free download this YouTube HD Video Downloader, and download the best HD videos from YouTube. How to Download HD YouTube Video ? Step 1: Run this YouTube HD Video Downloader. Step 2: Add video urls and start downloading the HD YouTube video. Go to YouTube site and search for the HD videos your would like to download. Copy the YouTube video download link from YouTube webpage. Click on the Add URLs button, then a dialog will pop up, just click icon, and paste the download link to it. You can continue to paste more YouTube video links as the previous steps. Step 3. Find downloaded HD videos. Show the file management panel and click the profile in the left panel, then right-click the Downloaded file, click Open Destination File Location from the pop-out menu. 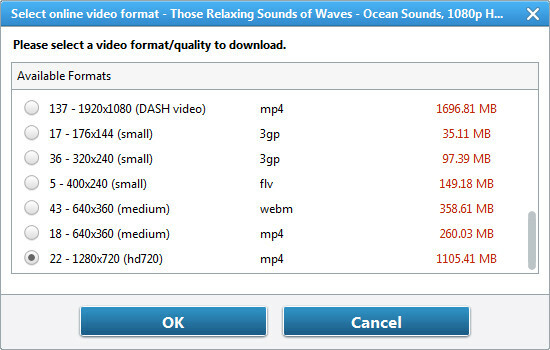 Now, you can find the HD videos downloaded from YouTube. 2. Extract audio track from audio CDs. 3. Convert DVDs & CDs & videos to 200+ formats for various devices including iPhone, iPad, Samsung Galaxy Phone etc. Just free download HD videos via this smart YouTube Video Downloader and enjoy them anytime !